The difference we see in people before and after they do “the first trip” since the onset of their disability is incredible. It doesn’t matter the nature of the disability. It can be a SCI, stroke, Multiple Sclerosis, ALS or any one of the many reasons people can find themselves using a wheelchair. When something seemingly tragic happens in our lives, it’s normal to feel loss and fear. For many people “traveling” is one more thing they feel they’ve lost the ability to enjoy. The good news is, travel is almost always still possible. Repeatedly, our team has worked with the details needed so that someone newly disabled can have an amazing vacation experience and, in the process, can take back some of their power. We love hearing their excitement after that first trip! One of the most powerful testimonials for us happened a few years ago when Mary called our office. Their family consisted of her and her husband along a daughter and two sons, ranging from late teen to mid-20s. Two years earlier, her eldest son broke his neck in a car accident. Specifically, Jack had a C5/6 incomplete break. We discussed Jack’s disability needs and abilities. Then I wanted to know about her family’s interests. With some gentle probing, I learned about how incredibly active and sports-oriented this family used to be. Jack’s injury seemed to put a stop on that for everyone. My impression was that guilt over being able to be active for the rest of the family was holding everyone prisoner. Wow. I learned that the kids (including Jack) and father had C-cards for diving. Jack hadn’t even been in a pool since his accident. The mom wasn’t into diving, but loved water. The daughter enjoyed her Spanish class at school. I presented an option that included rock climbing on the ship for the entire family with a staff experienced in working with paras. Plus everyone could swim on the ship because there was a hydraulic lift into one of the pools. The ship's "handicapped cabins" and public areas were very good for wheelers. I suggested an Eastern Caribbean itinerary because it’s the most accessible. 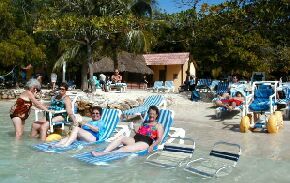 Beach wheelchairs on Labadee meant that Jack could easily be on the beach with the family. In San Juan, the daughter could practice her Spanish. And the best part? We could arrange for DIVING in St. Thomas with an outfit run by someone we knew who was a Handicapped Scuba Association instructor. They booked the trip and we included a surprise for them onboard--- a prepaid family portrait. After the trip, Mary called to tell me all about how fantastic their family vacation had been. She told me that she had been on the dive boat while her husband and kids were diving along with the HSA instructor. Her husband climbed back onto the boat with tears in his eyes and told her that he never thought he would see them all together enjoying the water again. Mary then confided in me that she used to have many family photos hanging on the walls in their home. But because she couldn’t handle seeing photos of her son standing previous to his accident and didn’t want new photos of him in his wheelchair, she decided to take down all of the family’s photos to paint the house and never hung them up again. Mary said the trip changed all of that. As soon as they got home, they hung the new portrait along with the old family photos back on their walls. And that is why Connie George Travel Associates has a team that specializes in accessible travel. P.S. Looking for more information regarding accessible cruising? Visit our Wheelchair Cruising website and have a specialist from our Access Team help you plan your next accessible cruise vacation! Like this article? Please share it with friends.